I was interested in getting a GPS for my car, particularly for navigating my way around the city. 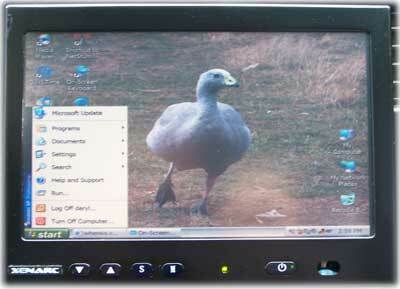 I've used a HP Pocket PC with GPS a few times and the navigation function was great. When looking for a house in, I used it to easily navigate from one address to another. No more getting lost, trying to balance the map on my knees or losing the page, it was just too easy. Punch in the address with the onscreen keyboard and press GO. Of course I could just go and buy a standalone GPS unit for about $600-$900 but I wanted more than just the GPS function. 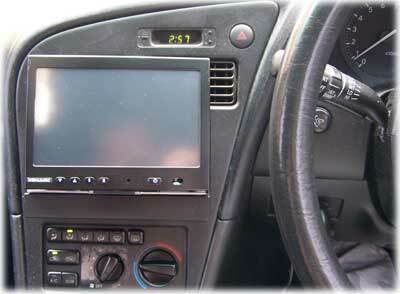 I wanted a larger screen and to have a larger collection of music than my JVC in-dash MP3 player could handle. Swapping CD's all the time and having to burn new cd's to update the music collection was a nuisance. I also wanted to be able to play podcasts because I've found some really good tech sites producing them. I spend many hours travelling every weekend and I soon get sick of listening to music or the radio all the time. I figured that I may as well try and learn something on those long drives each week. While I was studying Cisco CCNA, A+ and Network+ courses I found some great audio resources to keep me amused and help me to prepare for the exams. Some of the software for "Car Consoles" can also do mobile phone integration via bluetooth so you can dial directly from the touchscreen interface. CarTFT provide a time limited demo version of their inCar Terminal software when you order from them. It has a well thought out interface and is ideal for touchscreen operation. 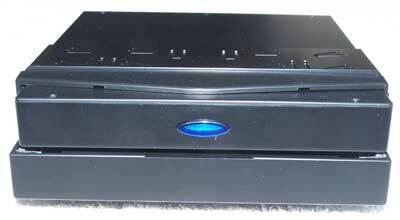 The Xenarc monitor accepts VGA plus two video inputs so a reversing camera is also possible. 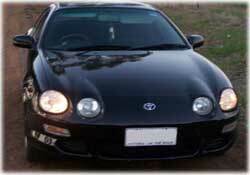 I saw one of these last week for $130 with LED's for night vision so at night you can see what you are about to reverse into. I'm just a bit hesitant to drill a 30 mm hole in the rear bumper bar to mount the camera. There must be a better way. Internet access would be helpful at times and it would be neat to be able to do wireless surveys instead of balancing a laptop on the passenger seat while you try to drive. 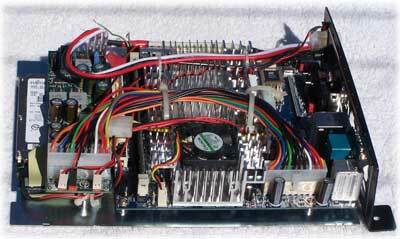 Motherboard: VIA EPIA EN15000 with a 1.5GHz CPU, onboard LAN, USB, Video, Firewire and onboard hardware video encoder. 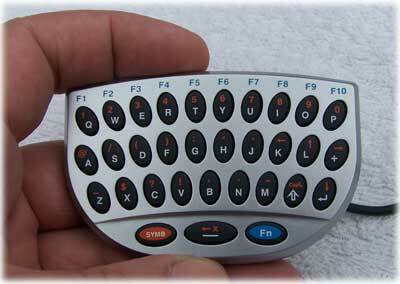 Keyboard: MiniKey (Tiny USB Keyboard) - fits in palm of your hand! I purchased the majority of the items from www.cartft.com but got the Xenarc screen from Panda Innovations. 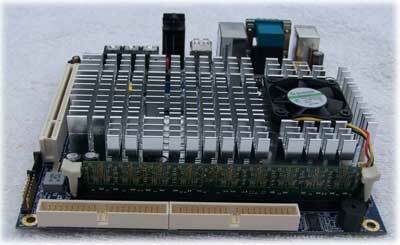 Total cost for all hardware so far is about AUD$1500. All of the items fit (very snugly) inside the Voom PC case. I placed the case on the floor behind the passenger seat and I mounted the Xenarc screen in the dash and ran the cables under the console and back to the screen and case. I got my local auto electrician to run some fused power cables from the fuse box back to the console. 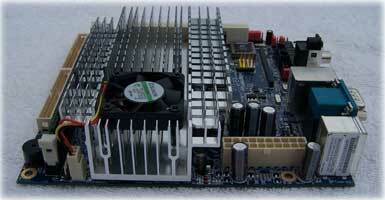 This motherboard is a new release from VIA. It has a 1.5 GHz CPU which has plenty of power to play DVD's and run all of the software that I want to use. 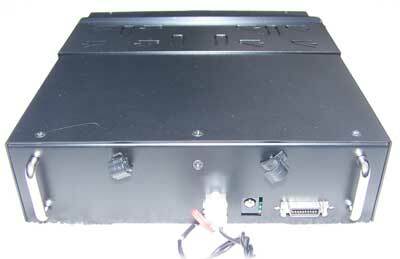 It delays turning on the power for 5 seconds, allowing you to start the car first without trying to start the PC while the engine is cranking (and drawing large amounts of power out of the battery). 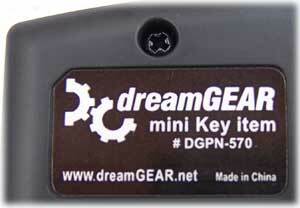 It can shutdown the PC 30 seconds after you turn off the ignition. Both of these settings are adjustable with a set of jumpers on the power supply. I ordered the low profile RAM, not knowing how much space I would have once the motherboard was mounted in the Zoom PC case. I now know that regular height RAM would have fitted fine and I could have saved a few dollars. 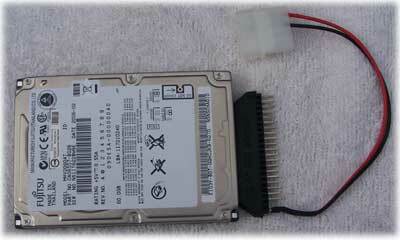 The hard disk is just a standard IDE laptop drive (60 GB) with a 2.5 inch to 3.5 inch interface adapter. There are four little rubber bushes underneath the drive to prevent any vibration. 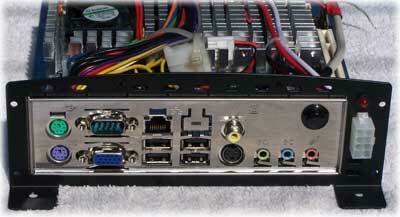 The Zoom PC case is purpose built for these small (Mini-ITX) motherboards. 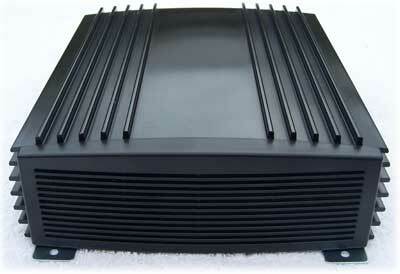 This very sturdy aluminium case has room for the motherboard, power supply and the hard disk. 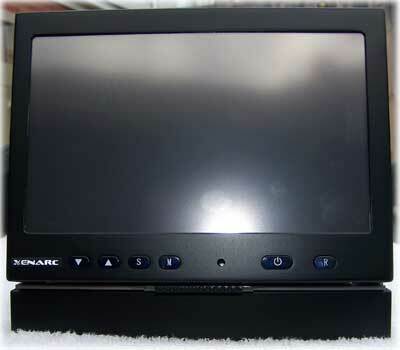 The 7 inch Xenarc TFT screen is probably the most expensive part of the whole system at just over US$435 delivered from Panda Innovations in the US. This is one of the top of the range screens available. It has a touchscreen interface via a USB connection to the PC. While some other screens have a motorised mechanism for the screen to go from retracted into the dash to fully open, I chose the manually operated one as it can also swivel left to right 15 degrees each way. The motorised screens do not have any left to right swivel. This is important to allow you to select the best position to prevent sunlight falling directly on the screen. I found lots of cheaper screens but many of these were "monitiors" for DVD players, not VGA devices. Some of them also could support VGA but did a conversion to produce less than acceptable VGA displays and usually only at 640 x 480. I had to read the specifications really carefully to find the right display and got lots of good information and recommendations from the www.mp3car.com forums. I bought this tiny little USB keyboard from www.cartft.com It works fine but is missing some keys like Control, Alt & the Windows key. I also use the Windows onscreen keyboard with my mini mouse. I bought this IBM mini optical mouse for $14 at a local computer swap meet. It is perfect for use in the car and I put some small Velcro patches on the console to keep it in place. Being optical I can easily use it on almost any surface including the console or even on my knee (not while driving!). Feel free to leave comments or ask any questions :- daryl (at) swtech (dot) com (dot) au.